This book fills the need in this growing market for a lucid and comprehensive description of the complex and exciting world of primary care. It is a readable "ready reference," positive in its approach, straightforward and factual in its style. This text also includes extensive references for further information and relevant clinical content that provides general information on subjects relevant to nurses in primary care, avoiding protocols which may vary from one area to another. Key facts relating to specific areas are presented in boxes throughout the text. SECTION 1: BACKGROUND TO PRIMARY CARE. What is Primary Care? Whos Who in Primary Care? Teamworking in Primary Care. General Practice. 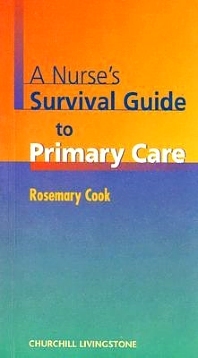 SECTION 2: NURSING IN PRIMARY CARE. Patients and Clients. Settings for Care. Patientsin Primary Care. Professional Issues. Practical Matters. Infection Control. Dealing with Drugs in Primary Care. SECTION 3: PREVENTIVE ACTIVITY. Health Promotion Work. Cervical Screening. Immunization. Contraception. Chronic Disease Management. Health Screening and Assessment. Child Protection. Protection of Other Vulnerable Groups. SECTION 4:TREATMENT AND CARE. Wound Care. Ear Care. Infestations. Minor Surgery. Infectious Diseases. Palliative and Terminal Care. Complementary Therapies. Continence. SECTION 5: EMERGENCIES. Anaphylaxis. Myocardial Infarction. Acute Asthma Attacks. Hypoglycaemia.SECTION 6: OTHER ACTIVITIES. Patient/Client Advocacy. Consulting the Public. Profiling and Needs Assessment.